Hats are always there for you. Bad hair day? Toss on a lid. Need protection from the sun? It's hat time. Hair's thinning up top? Grab a cap. Luckily for fans of Minor League Baseball, there are tons of options. In addition to the 160 primary team hats, most clubs have multiple variations available; in fact, some of the most popular are from the Copa de la Diversión initiative, launched last year, or alternative team identities that show off the light-hearted side of the Minors. 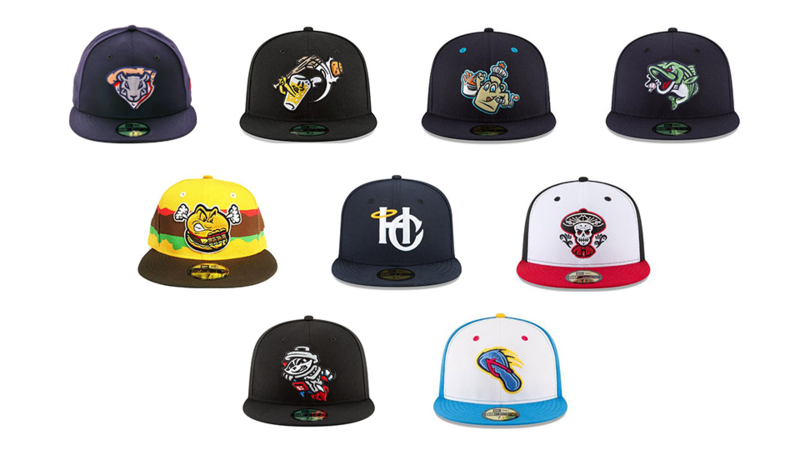 Below are just a few of MiLB's top-selling hats from 2018 -- according to purchases through the official league store -- and some reasons why we think they're pretty great, too. The No. 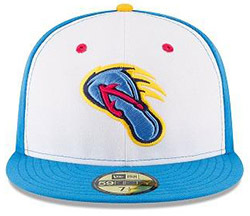 1 seller in 2018 belonged to San Antonio -- specifically this version of their Flying Chanclas cap from the Copa campaign. While the chancla holds a cultural meaning that caused youngsters to fear their mothers and abuelitas for generations, it's a rather simple design -- a flip-flop. 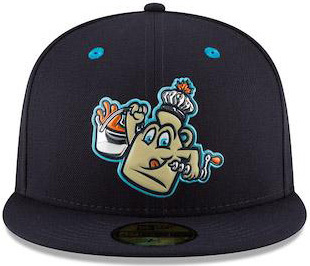 Of course, San Antonio fans might be attracted to the color scheme and want to buy some new swag to support their home team, but baseball fans outside the area may identify with the meaning behind the logo, too. Minor League senior brand manager Ryan Foose was one of the collaborators who helped develop the concept and its execution. "I think Flying Chanclas just hit every market it kind of needed to," he said. "For one of the first times ever, a team looked at an entire culture, rather than a specific city or specific fan base. ... San Antonio was definitely the perfect city for it, with a fun-loving, vibrant feel." The video hardly shocked native New Yorkers, but the famous clip of a rat carrying a slice of pizza in the New York City subway became a viral phenomenon. Staten Island capitalized with the genius idea of changing their name to the Pizza Rats on occasional Saturdays throughout the season. The cap design is relatively simple and self-explanatory, and it helps that the scoundrel appears friendlier than one you'd encounter on an F-train platform. In an effort to establish an identity separate from the parent club, team president and operating partner Will Smith began brainstorming with Brandiose, a branding company that has worked with many Minor League teams and assisted on at least four of the hats on this list. For Staten Island, Smith said, this was an effort for a full rebrand, rather than a one-off venture. The results paid off through sales. "You think it's going to hit. You think it's going to be successful," Smith said. He and his staff were correct. "One of the reasons why we did pretty well was we took a pretty big risk and ordered a lot of them." To start, Staten Island ordered 800 caps. When those began flying off the shelves, Smith quickly ordered 2,400 more just to try and keep the hats in stock. "We probably left money on the table," Smith added, "but you just have no idea of 'How far are we really going to reach here?'" By the looks of it, plenty of fans ate this one up -- much like the rat and his slice that started it all. 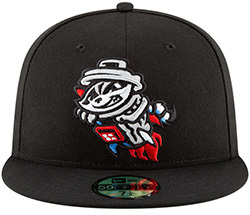 It seems like a cruel epithet for "raccoon," but this is part of a trend Minor League teams have followed in recent years: creating a unique brand with nicknames off the beaten path (see also Blue Wahoos, RubberDucks, etc.) This might be one of the most innovative, although the team won't debut until the 2020 season. This hat could have been in Guardians of the Galaxy and no one would have blinked an eye. There's also a meta feel to this one -- the lid of the trash can basically serves as a cap for our furry friend. And did we mention the whole rocket part? Raccoons and rockets, that's one way to have a surefire product. But the unveiling of the team last year also surely assisted in sales. "Be honest with yourself. Would you be talking about it? No," MiLB.com business reporter Ben Hill said. "The reason these people are talking about it is because it gets attention. When you're in a comparatively marginal sports entity like Minor League Baseball, you're not naturally going to be covered in any large or mainstream way unless you do something that breaks through." 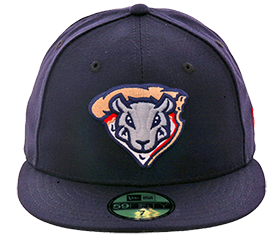 The Isotopes already have one of the cleaner logo/apparel combos in the Minors, so naturally their Copa project had high expectations. And with their Mariachi fits, they did not disappoint. The melodies from a traditional Mexican Mariachi band are unmistakable, but this hat delves deeper into Mexican tradition. Debuted on Cinco de Mayo as part of Albuquerque's Copa celebration, the logo on the front features a skeleton that invokes the Dia de los Muertos, or what Americans know as Halloween. The cadaverous figure is dressed in traditional Mariachi garb with a red shirt and a black sombrero (another example of these hats having a meta feel). 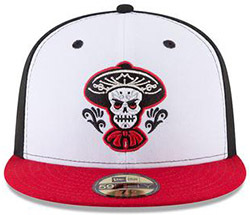 Further, the black-white-red color scheme on the skeleton and on the rest of the hat offer a satisfying symmetry. "I think Albuquerque definitely sold it to their community, and their community was completely supportive of the idea more than anything else, and that was one of the reasons they won the Copa," said Foose, who also worked with the Isotopes on the idea. "It was so ingrained in their community. A mariachi has a lot of meaning and a lot of relevance, and people love that they're kind of being shown some love." There's a lot to like about this one. 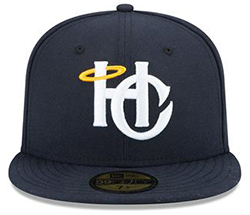 Charleston is also known as the "Holy City," hence the HC intersecting logo with a halo in the top-left corner. Chucktown received that pleasant nickname because it used to be one of the few Southern cities known for its religious tolerance. And if you've ever been to Charleston, you're well aware of the numerous historic churches in the area. Once again, this is an example of an organization capitalizing on the pride of its city and executing a clean, simple logo to attract buyers. If anything, this lid making the list is proof that sometimes, less is more. "A good hat is one that meets two criteria," Hill said. "It speaks to the place in question, wherever that may be, while also having an appeal beyond that place, sort of a best-of-both-worlds scenario." And that's exactly what this lid accomplishes. Sometimes, popularity comes down to just being different. 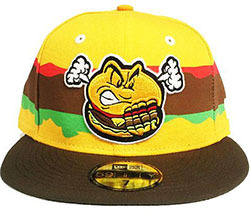 And this hat is definitely that, from the colors to the cheeseburger appearing quite literally steamed, in the emotional sense. Steamed cheeseburgers are actually quite popular in central Connecticut, but difficult to find outside the area. The unfamiliarity is one way to have more eyeballs on a piece of merchandise. "When you do have stuff that's off the beaten path, or gets the attention of the Internet, or something that hasn't been done before ... it just gets attention to the franchise in general," Hill said. "That translates to merchandise sales. I think the teams would also hope that a secondary thing is just more eyeballs on the team in question." 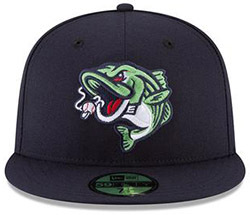 After existing as the Braves, like their parent club, for nine seasons, Gwinnett rebranded prior to the 2018 season as the Stripers. By doing so, the team adopted a name local residents can identify with thanks to the striped bass commonly found in Lake Lanier, which is adjacent to Gwinnett County. Green-bodied and red-eyed, this striper is taking the bait on the hook -- a baseball. "Logos, by nature of existing, are forms of publicity because it's an identifying mark for what is at the end of the day -- a business," Hill said. And with the rebrand, a team that exists outside a large metropolitan area (Atlanta) all of a sudden had a ton of new merch to sell. Breakfast food lovers are often divided into two camps: pancakes vs. waffles. (Like both? Even better.) But the good news is that you can put syrup on either, and for syrup lovers, there's plenty of it on this cap. The Maple King itself is a jug of syrup, and he's a carrying a bucket of what appears to be even more of the sticky substance. Up top, the Maple King sports a cute chef's hat with a maple leaf attached, another nod to the expansive maple sugar industry that calls Vermont home. "At the end of the day, it needs to connect," Foose said. "It needs to say, 'I love this logo,' and it probably needs to go a little bit outside the box. ... You need to have something that kind of pushes boundaries a little bit." Beer snobs across the country can get behind this lid. The greater Grand Rapids area is home to more than 80 breweries and is considered to have one of the best brew scenes in the country. And that's where the "Bung Hammers" nickname comes in. A bung hammer is a nifty tool used to seal and unseal the bung -- a wooden stopper -- on the side of a craft beer barrel. Backstory and creativity aside, this is a great topper because what goes better together than baseball and a nice, chilled lager? 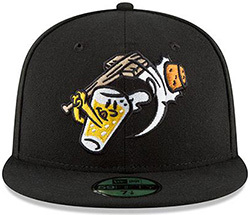 And the logo on this cap is swinging the aforementioned bung hammer, making it look like an ale not to be messed with. "There's no other sports property in the world that has as much fun with its fans than Minor League Baseball," Foose said.